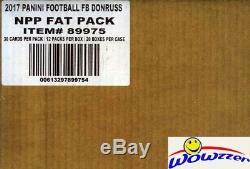 2017 Donruss Football Factory Sealed 20 Box Jumbo Fat Pack CASE-7,200 Cards! We are Proud to offer this EXCLUSIVE 2017 Donruss NFL Football MASSIVE Factory Sealed Jumbo Fat Pack CASE! This Factory Sealed CASE includes TWENTY(20) Factory Sealed Jumbo Fat Pack Retail Boxes! Each of these Amazing Factory Sealed Jumbo Fat Pack Boxes includes 12 Packs with 30 Cards per Pack for a Total of (360) Cards Per Box!! Every Pack includes FOUR(4) EXCLUSIVE Press Proof Blue Parallel Cards that can ONLY Be Found in these Boxes! Plus on Average find (3) ROOKIE Cards and One Insert in every Awesome Pack! Look for Rookie Cards and Rookie Autographs from Deshaun Watson, Mitch Trubisky, Leonard Fournette, Dalvin Cook, Christian McCaffrey, Patrick Mahomes, D? Onta Foreman, Mike Williams, Josh Dobbs, Davis Webb, Jonathan Allen, Alvin Kamara, Corey Davis, John Ross, Deshone Kizer & MANY MORE! Look for Cards, Memorabilia, Inserts & Autographs of NFL Superstars and Legends including Aaron Rodgers, Dan Marino, John Elway, Jerry Rice, Steve Young, Emmitt Smith, Joe Namath, Andrew Luck, JJ Watt & Many More! Collect Awesome Inserts including 1981 Tribute, Ground Force, Up Tempo, Salute to Service & More! Collect the whole 400 Card Set including 100 Rookie Cards! Good Luck with your Pulls! We stock a Huge Selection of Factory Sealed Boxes from every Sport! Plus the Largest Collection of Graded Cards in the World! Note on Factory Sealed Boxes and Cases and Graded Cards. S samples and are not guaranteed to be in any particular box or case. On Listing for Beckett BGS Graded Cards. We answer all emails within about 24 hours Monday through Friday. We are an Internet only company; we do not have a retail location. Get business information that counts! - Vendio Counters are active content free. 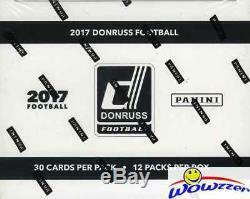 The item "2017 Donruss Football Factory Sealed 20 Box Jumbo Fat Pack CASE-7,200 Cards! HOT" is in sale since Monday, April 9, 2018. This item is in the category "Sports Mem, Cards & Fan Shop\Sports Trading Cards\Football Cards".